What is a collection? In the context of an art museum, a collection is an accumulation of artworks by a private individual or public institution, gathered for study, comparison, and/or exhibition. This term can also be applied to other types of museums, for example, history or science. A museum is a place where a collection is taken care of, studied, and displayed for the education of the public. Some collections have hundreds of thousands of objects in them while others are focused and thus much smaller in number, but not importance. Some art museums focus their collection on only one artist, time period, or style. Other museums try to offer an encyclopedic overview of all of art history, a daunting task! Here at FWMoA, we focus our collection based on our mission which is to “collect, preserve and present American and related art to engage and educate broad and diverse audiences throughout the region to add value to their lives.” Our mission guides our collecting practices so we accession, or take into our permanent possession, only works that we feel can be justified by it. It is our duty to protect any piece that we accession in perpetuity, so before we accept something we must be sure we can commit to its upkeep and safety long-term. If we can’t make that commitment, we do not accept it into our collection. How did collecting begin? Historically, people gathered the spoils of war, like the objects of conquered peoples, as symbols of wealth to show their own power and importance. Objects were displayed in religious temples, tombs of pharaohs, palaces, and kept in royal treasuries. Gathering objects for their own artistic merit wasn’t done until the Hellenistic period, around 323BC until 31BC, just after Alexander the Great died. Romans collected and displayed earlier Greek statues and sculptures, noticing the different styles and techniques the sculptors used and grouping them together that way. When a collector died, they might donate the collection to a temple, marking the earliest beginnings of museums. From the medieval period onward, palaces, churches, and other manor homes would have halls of artwork and objects on display, but only accessible to the “appropriate people” i.e. the nobility. These private collections would form the base of many later public institutions, but would only start to become public around the 1600s. The oldest art museums in the world are the Capitoline Museums in Italy, founded in 1471 with a donation of sculptures from Pope Sixtus IV. Many other museums were founded in the 18th and 19th centuries, including the British Museum (1753), the Louvre (1793), and the Metropolitan Museum of Art (1870). Our own FWMoA was a late bloomer, created in 1921 with a donation from Theodore Thieme. John Bower, American, b. 1949. House, Monroe County, IN. Silver gelatin print, 2002. Gift of the artist, 2018.169.15. Today, collections continue to grow from donations by private collectors and through purchases. There is a misconception that everything donated to or bought by a museum must become part of its permanent collection, when in truth there are several questions a museum must answer before accessioning any objects. These questions differ from institution to institution but some examples are as follows: Is the artwork relevant to the institution’s mission and scope of the collection? Are there other parties interested in the artwork which might object to its transfer into the institution’s permanent possession? Does the artwork pose any danger to other artwork in the collection or to staff? Does the institution have the resources to properly care for the object? And so on! The staff of the museum must answer these questions thoughtfully and, most often, a board of trustees will then decide whether or not to accept the object based on staff recommendation. Once accepted, the object is given a unique catalog number and stored appropriately. Typically, the catalog number is an indicator of when a piece came into the permanent collection, based on the year and how many pieces came in during that time. For example, House, Monroe County, Indiana by John Bower has the accession number 2018.169.16. You can decode this number to find out that this piece was admitted into the collection in 2018, was the 169th item that year, and was the 16th in this particular catalog added to the museum. The hydrothermograph in “Stone Truths: Lithographs from the Collection” monitors the humidity in the room. Works on paper are extremely fragile, and require specific conditions to be maintained. The storage of objects away from the public, artistic objects especially, has been a point of contention between the general public and museums for a long time. Partially due to how the history of museums developed, it may seem in modern times that large institutions are hiding artwork from the general public, perhaps with elitist intentions. This is not true! While it is the duty of the museum to share their collection with the public, there is also a duty to correctly care for the collection. Some artwork needs to be kept from extended exposure to light and given “rest time” between exposures. Just like too much sunshine can burn our human skin, too much light can bleach a photo or print. Unlike us, a photograph can’t recover from a sunburn, so museums have to be proactive and not let the artwork be damaged in the first place! Too much sun can also raise the temperature of a space, another form of damage, or change the humidity. You might have seen a hydrothermograph (see photo above) in a gallery, usually tucked away on top of a movable wall. These instruments help us measure the humidity in a room to make sure it doesn’t get too high or too low. Too much moisture in the air can lead to works on paper becoming moldy, destroying them. Even if mold doesn’t destroy them completely, an artwork can become too fragile to display any longer and so museums put them away to preserve them as best they can for future study or restoration. Our newest glass acquisition,”Taking Off” by Stanislave Libensky and Jaroslava Brychtova, was just installed a few weeks ago! Photo by Amy Schreiber. Another reason a museum won’t have all their objects on display might simply be because they don’t have the space to do so properly. We have tried the salon style exhibition in the past, using our high walls to our advantage, but our visitors let us know they couldn’t see the highest paintings close enough. The disappointment of not seeing a piece up close was more than not seeing it at all. We choose what to display at any given time based on what our guests want to see, what new stories we can tell, and how we can best educate our visitors. Our mission directs us to educate and add value to our audiences’ lives, so we think long and hard about what we can share from our collection that will accomplish that. Sometimes purchases of artworks by the museum fill a gap in our collection, one that couldn’t be completed with what was initially donated. Sometimes a purchase is made to bridge a gap in knowledge, to show the connection between this point in art history and the next. Other times, an opportunity comes along that shouldn’t be ignored. 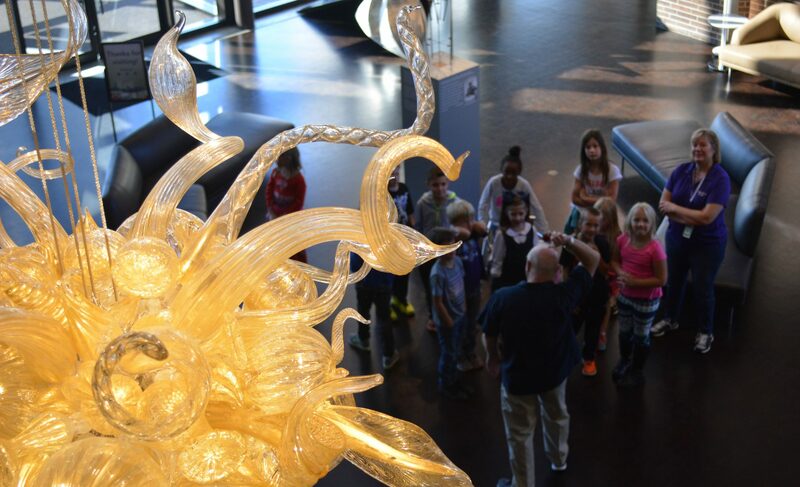 The Lily Gold chandelier by Dale Chihuly was purchased at art auction and was our best chance to attain a high-quality piece from a high caliber artist. We had to have it! Since Lily Gold became part of our collection, the quality of our glass collection overall has risen. More contemporary glass artists have become aware of us and, therefore, strive to have their work become part of our collection as well. One purchase led to the donation of a half dozen other artworks by collectors and artists alike. Luckily, we have the capacity and commitment to care for all our artworks and are very excited to share more stories about our collection for future generations to come! Next PostNext In the News: Where Does Art Belong?